If you’re sending your PowerPoint presentation to colleagues or friends, or if you're running it in a booth or kiosk, you might want people to immediately watch your presentation as a slide show instead of seeing the slides in edit mode. Save your PowerPoint presentation as a PowerPoint Show (a .ppsx file) so it automatically starts the slide show when the file is opened. Select File > Save as (or Save a Copy). Browse to the folder where you want to save your presentation. In the File name box, type a name for your presentation. Under Save as type, select PowerPoint Show. The file is saved as a .ppsx file. When the file is double-clicked, it opens as a slide show. In PowerPoint, click File > Open. Browse to the .ppsx file, and open it. In PowerPoint, click File > Save as. The file is saved as a .ppsx file. Now, when someone double-clicks it in File Explorer (or Windows Explorer), it'll open as a slide show. 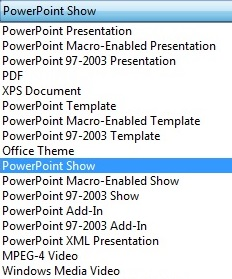 Saving a presentation as a PowerPoint Show (.ppsx file) isn't available in PowerPoint Online. To start a slide show in PowerPoint Online, open the file, and on the View tab of the ribbon, select From Beginning. For more details on running a slide show, see Present your slide show in PowerPoint Online.